Dont forget to sign up for the Newsletter. "Wow, I just found out that a lot of folks from Ukraine have been following my blog for Easter. 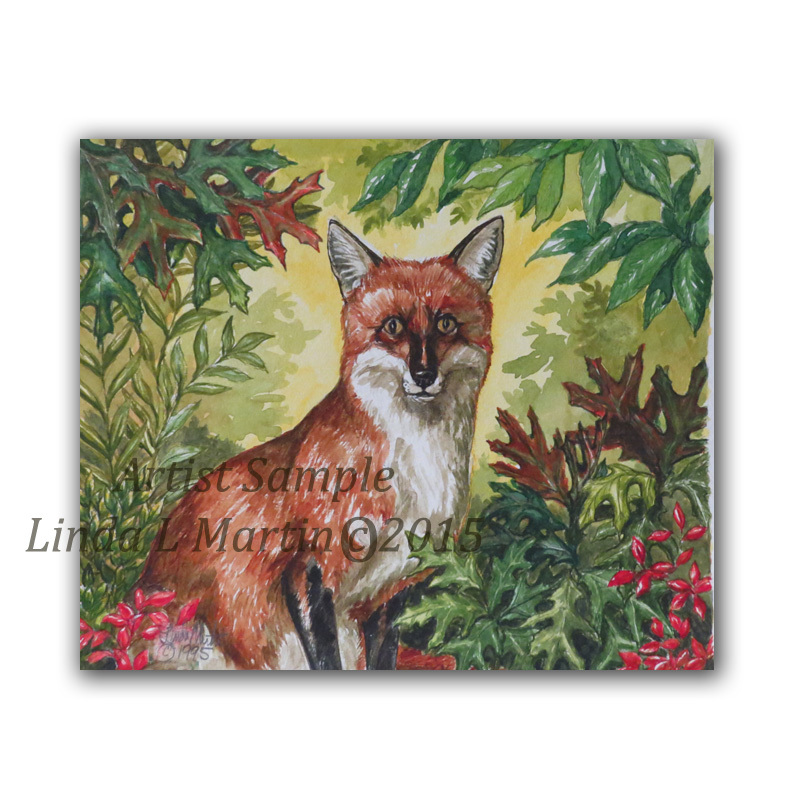 Welcome Blessings to you all and thank you for looking. Some of the most beautiful eggs that I have ever seen decorated for Easter were from Ukrainian Artists. In fact thank you everyone from the US and around the world for taking the time to see my blog. It is much appreciated." I could not decide which of the two remaining Easter Paintings to put up first so I decided to put them together. The first is the one of Christ Victorious, After he rose from the grave. 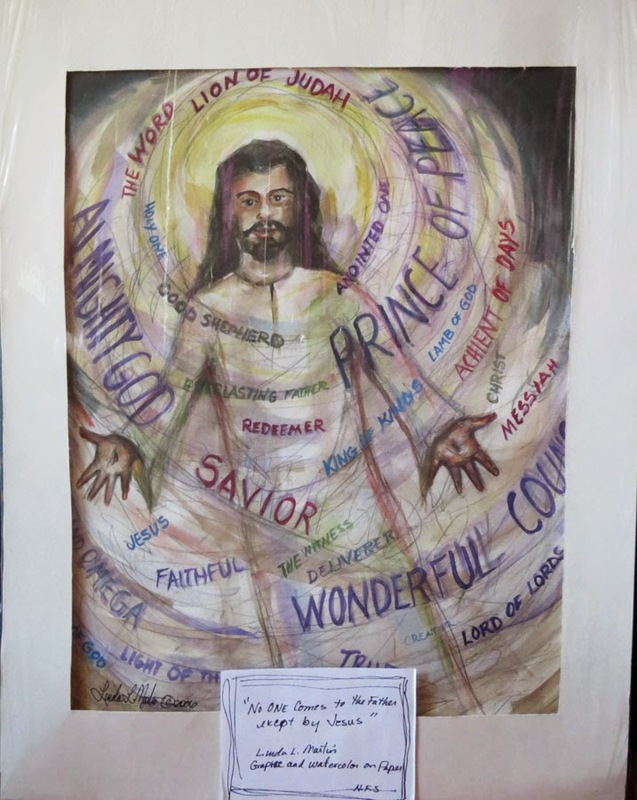 The point of the painting is once in doing that, everything that was ever claimed was substantiated and every name given him was fulfilled at that moment. It can never be taken away. All power, all glory all might. It is huge. And hard for most of us to even begin to understand. I am not some one who claims to know it all or even understand it all but I do know that my choice in following God could not be made possible except that Christ fulfilled his destiny... that he lived, died, and arose from the dead then ascended into heaven to prepare the way and the time for us to join him. Some wonder why an all loving God, an all knowing God could allow people he loves so much to suffer. God knows our hearts and minds... we dont know each other's hearts and minds. Ever action or reaction to God and the things that happen to us are evidence that we either love him or reject him. Keep in mind that the view most of us have of heaven is probably not the reality. The reality is that where ever God is that is where heaven is. Why would God want anyone to live with him in his house who hated him and rejected him. My view is that this life is so we have the opportunity to either accept him or reject him. In rejecting Christ we reject God. It is all forgivable except that we refuse to believe Christ. In not believing Christ ... we give up any rights or claims to be with God. If we reject the Son of God we reject God. Why on earth would anyone on this earth want to live with someone they hate and dont like. I have found that a lot of people say they are Christians not because they Love God or believe him, but because they cannot stand the idea of not being in heaven. They believe they are as good as anyone else and they probably are. Yet that is not the standard that God sets with us. We are not to compare ourselves with those who fail in perfection.. sinlessness, and personal agendas and we are not to use our frail nature to condemn one another or excuse our own actions. God's way is not to compare ourselves to other people, it is to compare our selves to him. God is the perfection and no one can be as good as him, know as much or do as much... I heard a Alan Hood speak in Fredericksburg, Va in 2006. What he said I had read over an over through out my life.. he was focused on a scripture in Revelations 4:8. "Each of the four living creatures had six wings and was covered with eyes all around, even under its wings. Day and night they never stop saying: “‘Holy, holy, holy is the Lord God Almighty,’ who was, and is, and is to come.”Alan told us that they weren't chanting that they were searching God continually trying to find an imperfection .. searching every aspect, inside and out, trying to find one flaw, one bad thing, one mistake... and they could not. They could not take their many eyes off of God and the power of his Holiness was more and more astonishing to them, the reality of his Holiness was more overwhelming with each lingering and each searching of his depth. They are continuously searching him out and still are. And Crying Holy, Holy , Holy with each breath all the time. I realized at that moment that understanding the never ending Holiness of God is a game changer. At lest it was for me. Because it isn't about how imperfect people around me are, or how I can or cannot meet their standards or my own. It is really about my relationship to God and that no matter what I do or say or create or accomplish I will never be as Good as God. That is humbling. Even more so, because he doesn't expect me or you to be even remotely as good as he is. And knowing all he knows about me, and each person out there, it is a true miracle that he loves us. 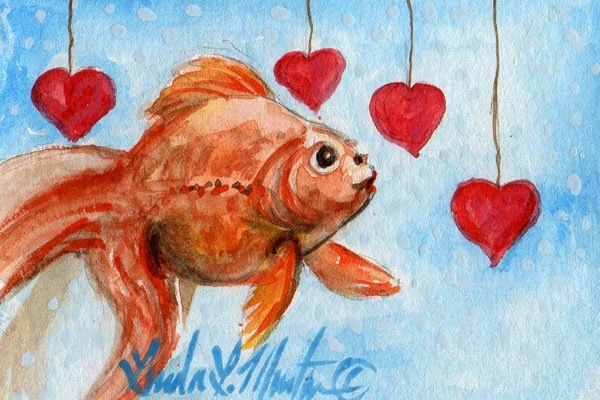 Loving us isn't about getting what we want or having God play "Santa Claus" to our every need. God's love for us is about us being reconciled with him and being taught through His Holy Spirit how to love, how to achieve, how to stay close to him. He provides to us what we need to follow his will for our life. He never leaves us or forsakes us and he does not break any promises. In fact, God is the only one with the power to actually fulfill a promise. Realization of this amazing Love and the Grace brings astonishment, humility and then extreme joy, and abiding peace. Which brings me to painting 4. 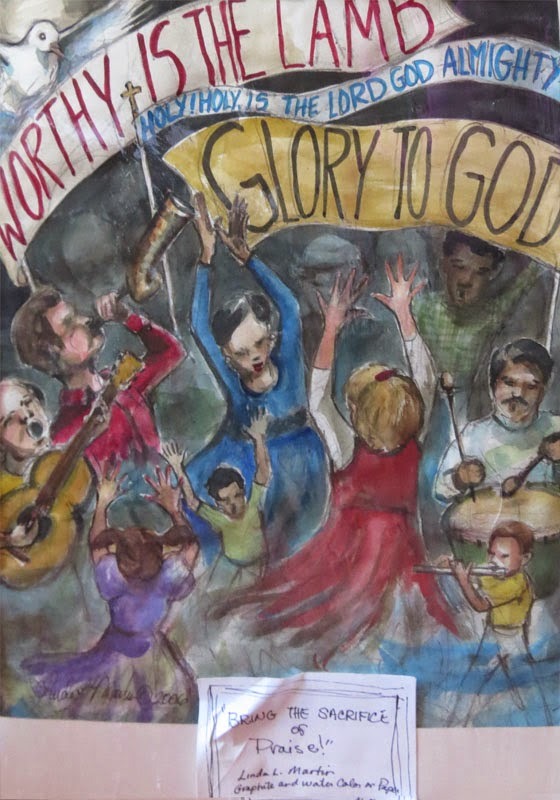 The scripture says that God inhabits the praises of his people... Worship and Celebration, including Thanksgiving are pleasing to God and bring about blessing. Its not about some weird trance or repetitive words.. it is about giving your whole heart, mind and body unabashedly to that intimate time with God,that transcends anything that can compare with a human experience. Worship refreshes you and strengthens you and releases the power of God to work in every aspect of your life. Knowing that the Holy God can love you so much has to be the most joyous thing we can experience in this life. But what is even more amazing must be the knowledge when you finally see God, that he embraces you and says "well done my good and faithful servant." The scripture says that every time a person gives them selves over to God through Jesus and embraces God's Holiness that every angel in all the heavens rejoices with God. You are that special to him. 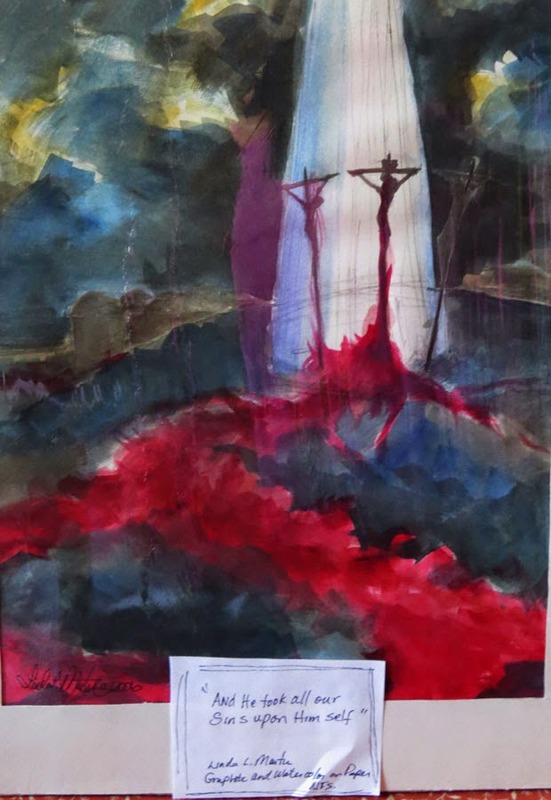 Painting 2 For Easter : Why they call it "Good Friday"
I live in a free country that protects our right to voice our opinion and protects our right to worship, or expression and our right to associate freely with whom ever we choose. It does not protect a bully who choses to harm me or anyone financially, physically, or through intimidation or through extortion of my rights in order to usurp my rights. Part of my faith is about the fact that forgiveness is real and sacrifice is real and compassion is real. All of these things I believe are what God's purpose for the cross is. With out these three aspects..plus God's own power over death what I believe is just another hollow political religion of conformists trying to out power everyone around them. Jesus did not die for a denomination. In fact he was the opposite of denomination. He was God made man to show us how to live, show us how to act out our faith and to show us that we can be forgiven anything and everything. 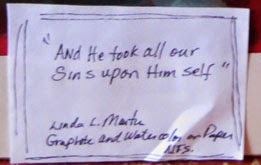 He took all the sins of those created, plus even those who had not been born yet, upon himself and took the punishment for us. His blood was shed to wash away the natural rebellion most of us feel toward God, when we would rather be in control. Truth is we really have little control over much in this life. If it were not for the fact that God loves us so much and is so patient with us ... that he gives us a life time to figure it all out. That the gift is God and the promise that shall never be broken: He will never leave us or forsake us now in this life or beyond. The only proviso is that we must receive the gift. The proof that the gift is has been received is a changed heart and mind, the ability to trust God, to recognize his hand in all things, his voice and we find we have a peace about all those things that we cannot control because we have no doubt that God himself is in control. We have no doubt that His love for us can reach us where ever we are in the universe. I cannot imagine what the darkness must have been like for those who had grown to think of Christ as their beloved teacher and family. How fearful and devastated they must have been to see this person who had healed so many bodies, hearts and minds... in complete humiliation, naked on a cross. His skin stripped from him with a whip embedded with iron. Some of my friends cannot understand how a loving God would allow his son to die such a horrid death. We cant imagine it. Cannot fathom it. Who but a loving God .... and how else could it happen...unless He is a God of no limits, who knew the outcome, that His son would live and not die...and that He Himself was His own son. It blows our tiny little human minds that there could be any logic in this. But since when is there any human logic in LOVE. Even the kind of God so loved the world ( all the people of the world) that he gave His only begotten son that who so ever believes in Him should have everlasting life... kind of love. 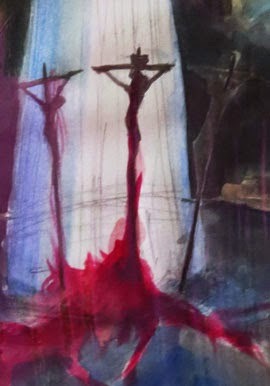 When I painted this painting .. . all I could think was the blood of Jesus ... was not measured in pints and liters. It was poured out in a never ending flood of love... that covered the whole world spiritually.. from the moment the first drop splashed down his face when they pressed the thorn crown to his head and it flows continually around the world bathing everyone who calls upon the name of the Son of God... this is such a gift.. such an amazing gift to bring life and second chances and I stand amazed, sit amazed... that God loved me so much that He sent His only son to die for my mistakes, my short comings, all of the silly things that went wrong in my life, even my inability to start out trusting God. That is the same love that He has for every single person that has lived or lives on the earth. We can choose or not choose to believe. This is the same love that He has for you. The love that passes all understanding and all human logic. 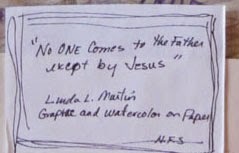 What I believe and Why I paint what I paint. We live in some very turbulent times. Times of change .. and times foretold by the prophets of old. We have lost our ability to discern the truth in words and we have lost our ability to see what is right in front of our face. I do not have to tell you that in these times things are going nuts. Even "Good Christian" people are out right attacking and disrespecting other " Good Christian" people. I expect to be occasionally persecuted by those who do not believe. But to be persecuted by those who say they are Christians is as much "anti-Christ" as anything out there. I've been praying about the personal attacks since they started... well every time I do or say something publicly or on facebook that I feel is a direct leading of God to do, yep someone attacks me. And I don't actually do much that is controversial. 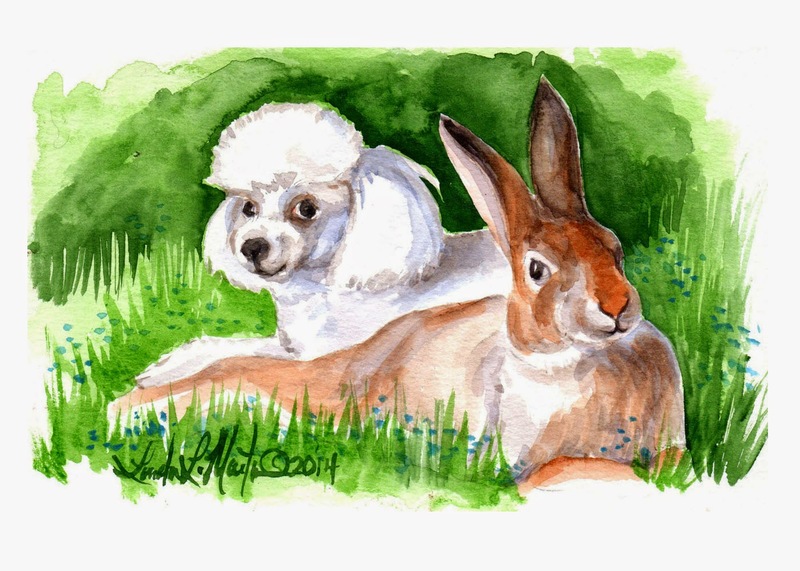 Just mostly, I paint animals. My calling is to bless people with my art. Jesus even instructed us to bless those who didn't believe him. So even in my imperfect little life in my sweet little town filled with imperfect people that is exactly what I am striving tirelessly to do every single day that God allows the breath to stay in my body and my heart to beat. And guess what.. It is only going to be done when He says it is done. Oh, yes, I do get discouraged. And sometimes I have to make myself paint or sketch or draw because of it. But hey, that is everyone's life, not just mine. This week much to my dismay and distraction.. a "good Christian" did not like my answers on a certain political debate involving "religious" freedom and instead of asking me the question, " What do you think about ________?" or "Do you support _______?" The person proposed a hypothetical thinking that I would show my hand on what I would do in a certain circumstance if I had to choose between what the established church said and what people who opposed it said. I said basically in all things I would seek to do "God's will" in each circumstance. Big mistake on my part... because what I actually did was to answer a hypothetical statement that really has no baring on faith or on what God might have me do in any circumstance. And you know what? It is actually outside the will of God and what the Bible says to even worry about those hypothetical things. God promises to put the words in our mouth that He wants us to say in any given situation when we trust him. I was distracted... yeah, it took me two days to figure out what had happened and what I did wrong. And it is not like I didn't know.I just didn't expect it to come at me from that unexpected direction. Whew. Hopefully I will be more vigilant in the future. So when ever you answer those questions, and make no mistake they are manipulative, it pretty much always gets you into trouble; because, it is pretty much meant to trip you up. Thus any response you give will either make you feel stupid, or guilty or to shame you into changing the way you think and often it will target you and open you up to abuse. I am going to tell you that any person who puts you into that situation is trying to control you. I , personally, seriously felt violated,over interpreted and totally misrepresented and need I say victimized? 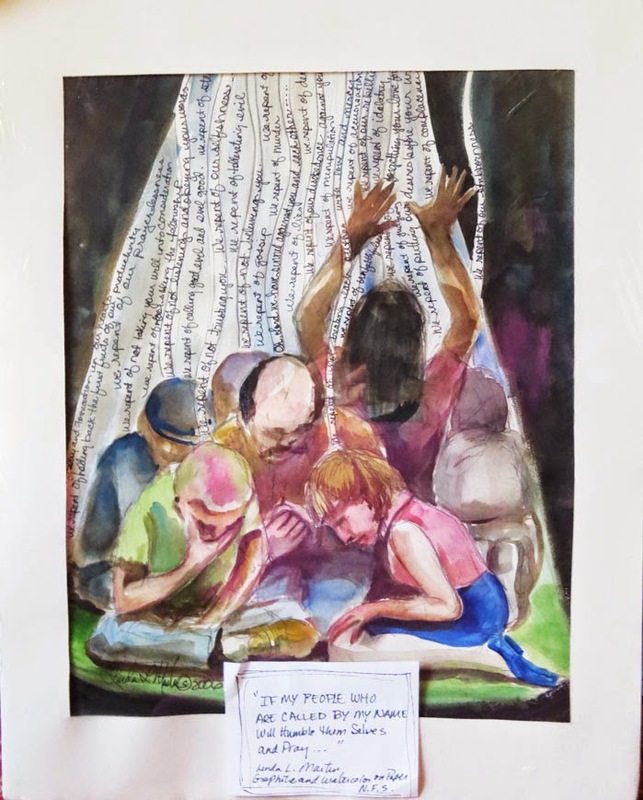 So over the next few days I am going to share with you 4 mixed medium paintings I prayerfully painted in 2006 that say exactly what I believe. There will be no arguments. No heated discussions. It is not meant to be offensive. I am just sharing my faith with you, which is a constitutionally guaranteed right in my country. I am doing it with the hope that you will understand why I love God so much and How much I wish everyone knew how much he loves all of us. Being Humble before God is not Humiliation. A person who loves some one would never Humiliate them. I have been researching the Heck Tarpan horses since I first saw them in person in 2010. They have personality plus. Just recently a friend has decided to sell a few of them, so I have been helping her to advertise a few of them. In the course of helping her sort out the emails of interest I have discovered people who still have the horses and are as in love with them as I am. 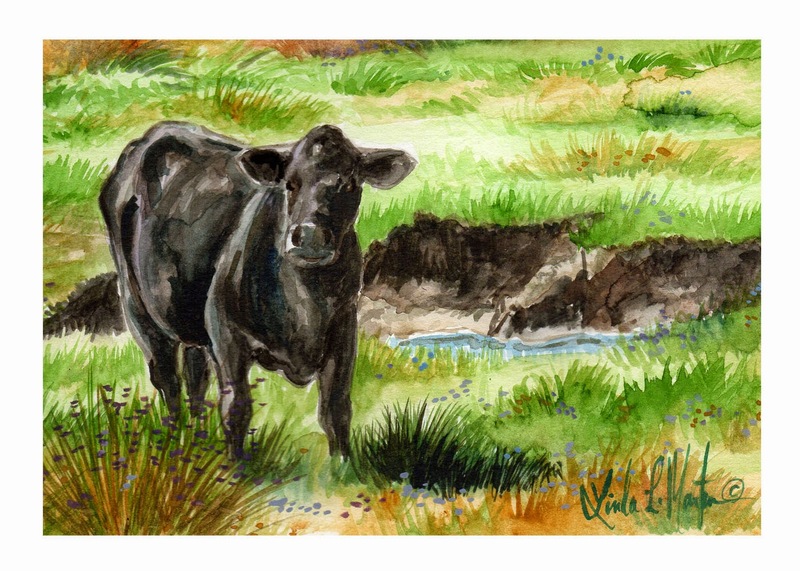 Of course being an artist means I have to do a few paintings,and thus I have. Some of them are already spoken for but I have a few that I will be sharing for sale on Etsy. And the best, like the best work of my choosing, will go on Fine Art America. Please enjoy the images here. 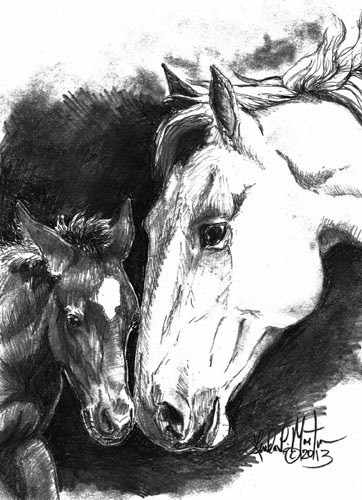 If you have never heard of the Heck Horses also known as Heck Tarpan or Tarpan please feel free to take a look at the Heck Horses in America blog. It has some of the history too. 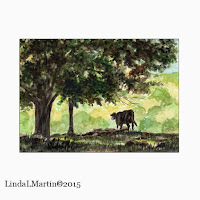 Confession of a Country Girl: Entering the world Creatively! 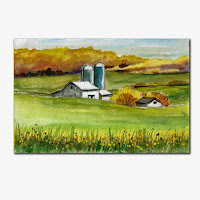 I wasn't born in the country; however, I have to tell you I am a country girl. 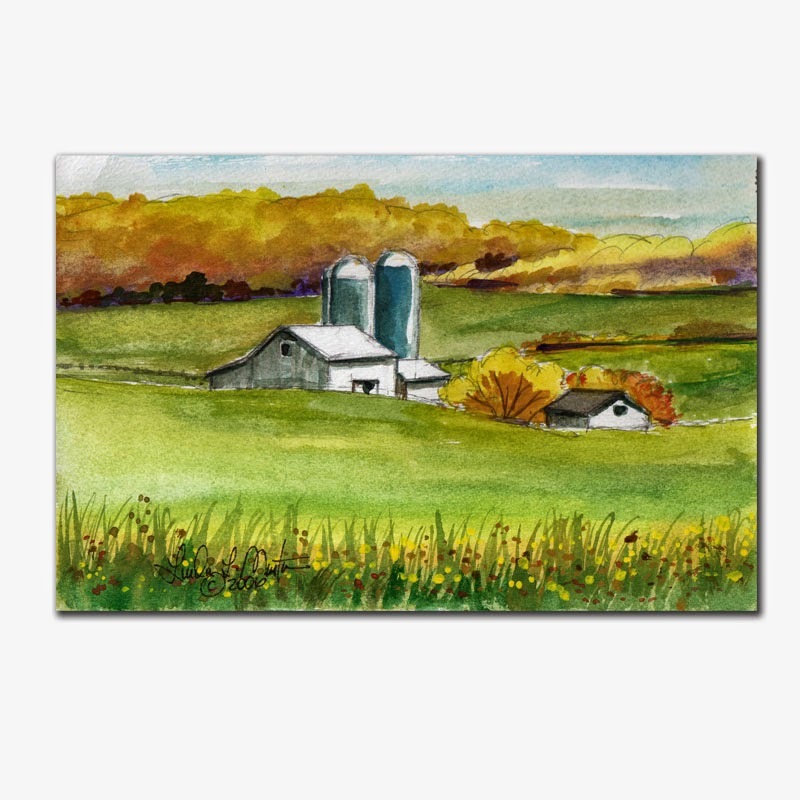 I cannot imagine myself living anywhere but a rural area. Preferably in Virginia. I have lived in every area of Virginia. Today almost all the regions where I previously lived are teaming with development and traffic. I love wild life, I love the people and I have to say, I love the animals. I love the green grass and trees. I love the solitude. Where I live now is a small town of about 350 people. Everyone knows everything about every one. During snow storms such as we had last night it wouldn't be unusual for a neighbor to show up with a shovel and just start to clear a path. No ulterior motives. no expecting any money. Just a "thank-you" and a " glad we could help out". I wish that everyone had such neighbors. But I have to tell you having those neighbors means you need to be as you wish those neighbors would be. It is not always an easy thing to do. Sometimes we move some where and we wonder why our neighbors are not friendly or why they do not invite us to dinner to welcome us. I mean that is what people do right? Well, this is where empathy and tolerance come in. When I moved in to my neighborhood it was more people over the age of 50 than anything. At the time one neighbor was on her third chemo for cancer, one man suffered from chemical toxicity from being in Viet Nam. One traveled a lot to visit grand kids. Another had to work 2 jobs because his wife had a stroke and rehab was long and drawn out as well as expensive. Not likely you were going to get to meet those neighbors unless you had an open house ( I'm too private for that anyway) or a yard sale! Yes, that is exactly what I did to meet my neighbors.. I had a yard sale right in my front yard. Everyone from two blocks in every direction came to see. I sold a lot of blue jeans and a few odds and ends . Didn't make much money but it was still a good day. I haven't had a yard sale since. I really haven't had the motivation. But I remember how fun it was. And that my friends at the time came to see me and one even brought me my favorite French toast for breakfast. Sometimes you just have to reach out to folks with out expecting anything in return. For my neighbor hood that was the right thing to do. I invited them in with no pressure and no expectations. First Steps are always important. If you do not enter into the world you really don't have a way to experience it or people. Be creative and Thrive! 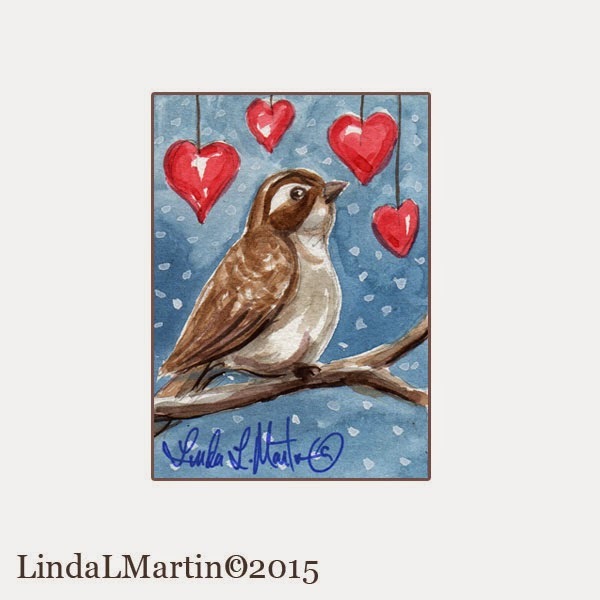 Heart warming: "The Thought of Belonging" my interpretation. A pARTy is when a number of artists throughout the world use a single photo to create a unique work of art in their style and using their creativity. 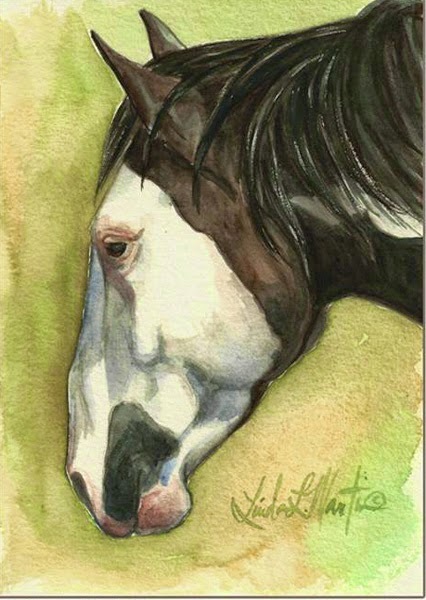 I first heard of such a thing from Artist Kimberly Kelly Santini (2015 Kentucky Derby Artist) and Linda Shantz , a Famous Canadian Equine Artist. Both women I know through facebook , however, I knew of their art long before connecting there. Participating in the pARTy is a lot of fun and gives artist’s a chance to connect with each other through social media, as well as show case their skills. When I participate, I tend to use it for experimental pieces or concepts. While we paint or are inspired by the same photo, we are free to sell our completed work but agree not to enter the resulting work in artistic competition. The photo this year was provided by Juliet Harrison, a Fine Art Photographer and Gallery owner in New York. Juliet is a cancer survivor and her dog Zevon , who was the subject of the photograph, was a rescue dog with a very troubled past. Both are incredibly inspiring individuals. 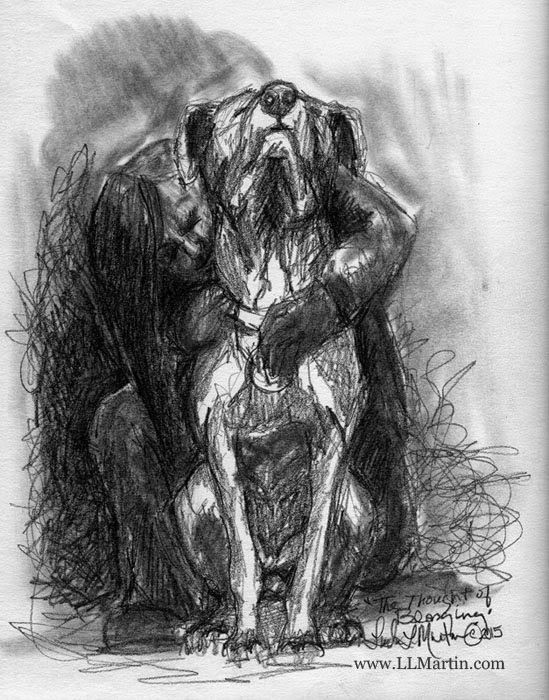 My piece for the pARTy is : "The Thought of Belonging"
It portrays that abstract concept of the reality verses the hope when the dog who has suffered so much suddenly realizes, " Yes! This is my person and we will always be together." Turning that Chore you Despise into an Act of Joy. or how I learned to love wild birds. 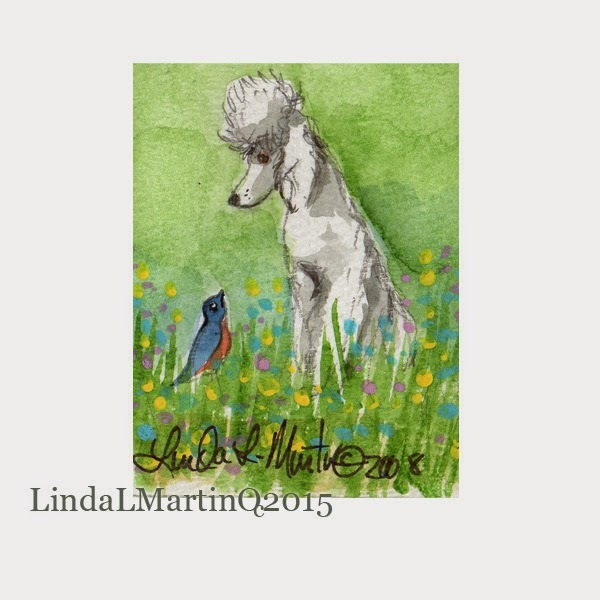 My love of wild birds came from the same source as my love of horses and dogs: My grandmother. Grandmother introduced me to wild birds during one of my extended visits with her. Much of my formative years were spent with my grandparents, as my parents were working hard to build a life. On one of my visits, Grandmother told me, she hated ironing. Ironing in the 1950s and 1960s was very important for a business man like my grandfather who sometimes had to wear two or three freshly cleaned and starched shirts in a day. So in order to endure the torture of her chores she set up a bird feeding station at the window in her laundry room where she could watch her wild birds as she worked. She knew each bird and all of their offspring by recognition and followed them and nurtured them for all of her life in that house. She taught me their names and what they like to eat. And she showed me that every single time there was something that was unpleasant to accomplish that there was a way to make it more than bearable and even a joy. It was a lesson not lost on me. When my grandmother came to live with us in her late 80s I suddenly found myself not only caregiver for my grandmother but also chief dish and bottle washer for the entire family. It was a thankless job. When I was a child my dad had tried to convince me that I was good at washing dishes. I knew even then , washing dishes was not something I ever wanted to be good at. I hated it even more by the time I was in my 30s. So, I took my inspiration from my grandmother. She taught me That when the labor of love is a despised labor , make it an adventure. I set up a bird feeder outside the kitchen window so the hours of dish washing and cooking would go faster. I am sure no one remembers that I did that every day for years on end. But I remember. And I am thankful to my grandmother that she taught me to love wild birds. 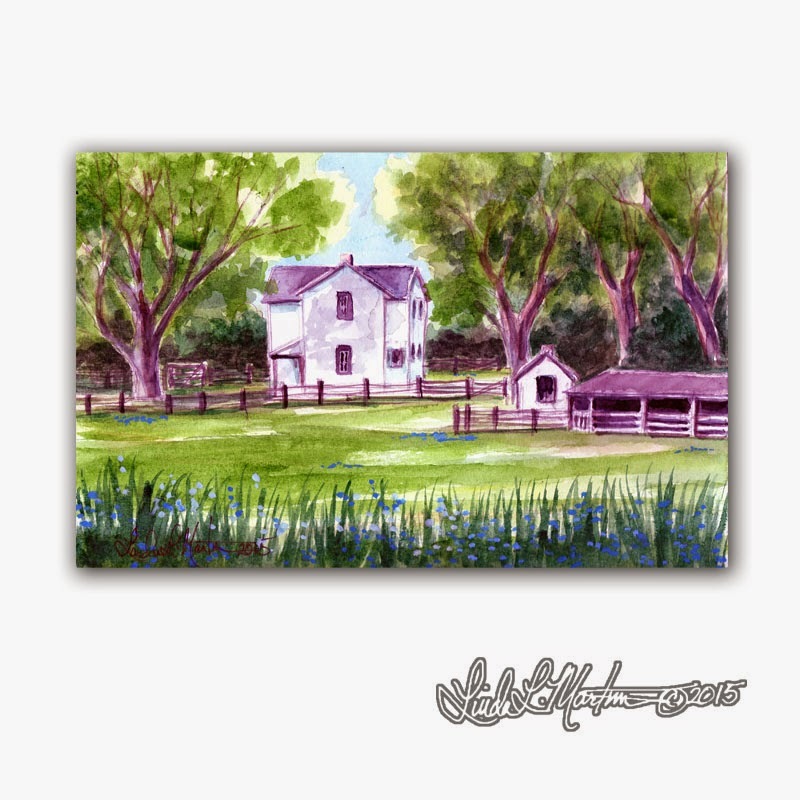 To purchase these fun original miniature paintings click the item to see what is available. 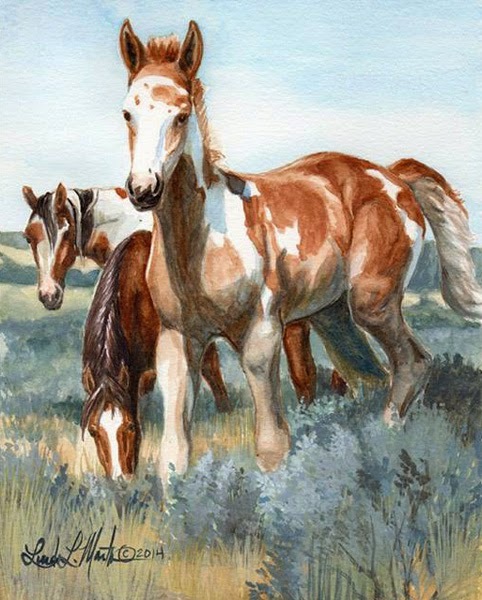 Every time you work in this type of watercolor you not only have to think out the painting in advance you have to think three steps ahead of yourself as well. I love that when you have control of the paint you can actually paint in layers. The next few sessions of this painting will be slowly applying layers of washes then letting them dry. If the paint is not too thickly applied, you can put many layers on top of the others. 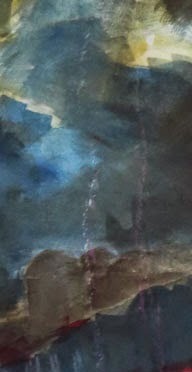 The warning, though, is that if you don't let them dry, then the last layer you add may lift the paint off the paper and leave you with a lighter, rather than a darker area than you intended. 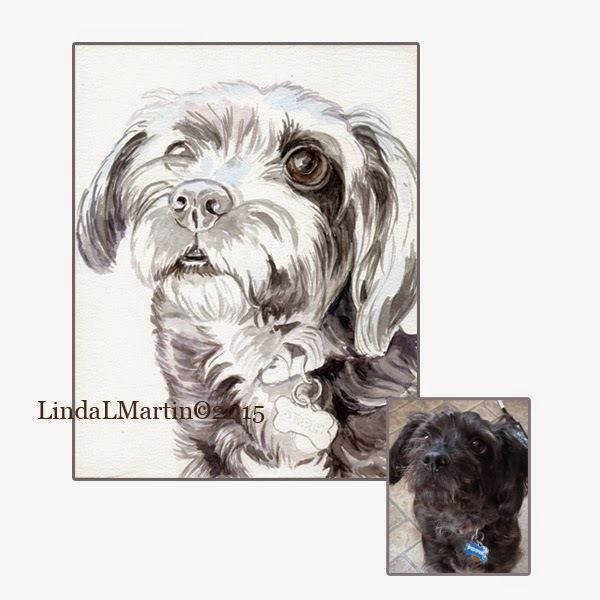 This painting will be an 8 by 10 watercolor head portrait of a JRT/Poodle Cross. 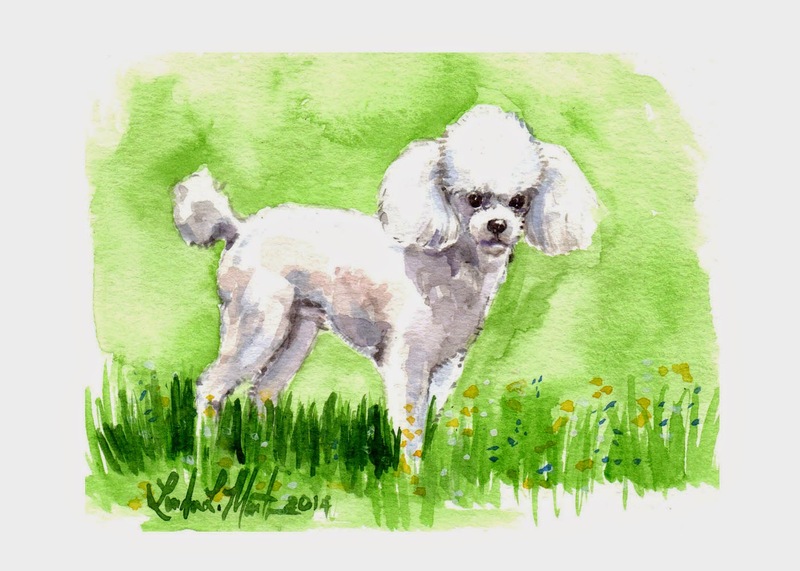 A Poodle for All Seasons! Surprsingingly Warm Art for Winter! 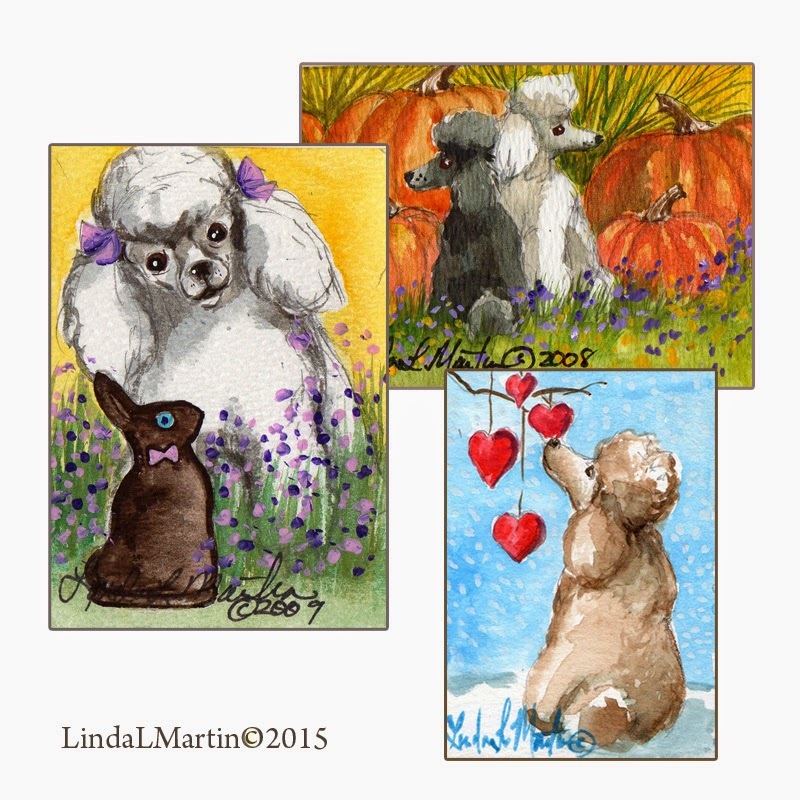 ACEO Miniature Art to warm your heart! 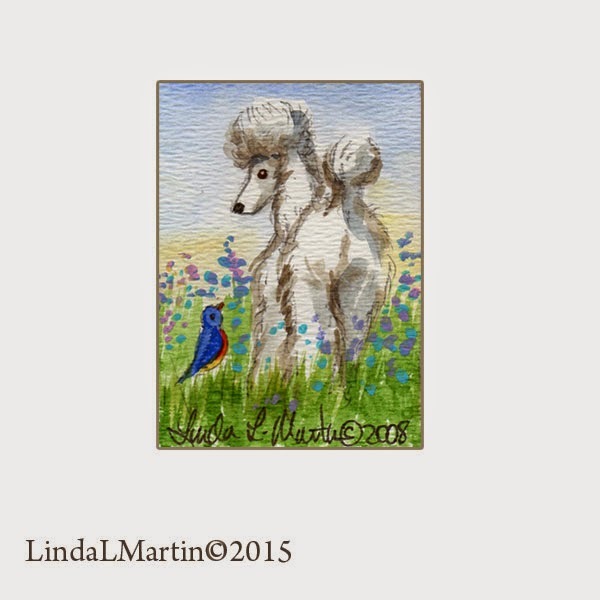 I just love painting poodles and letting them tell their own story. And yes I can paint one of these little paintings for you. Some people wonder about the prices of these little 2.5 by 3.5 inches works of art. The truth is the smaller the art and the more detailed the art the bigger prices they can be. I've heard of some miniatures selling for as much as $5,000 or more. Mine are a bit more reasonably priced. 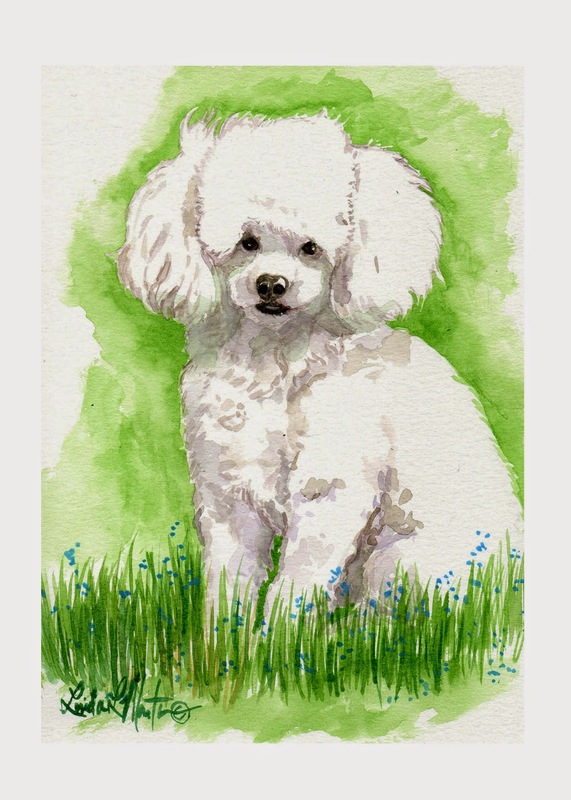 The Average is about $24.00 for an original. I start the auctions on ebay about $14.00 these days. The shipping is free in the USA. 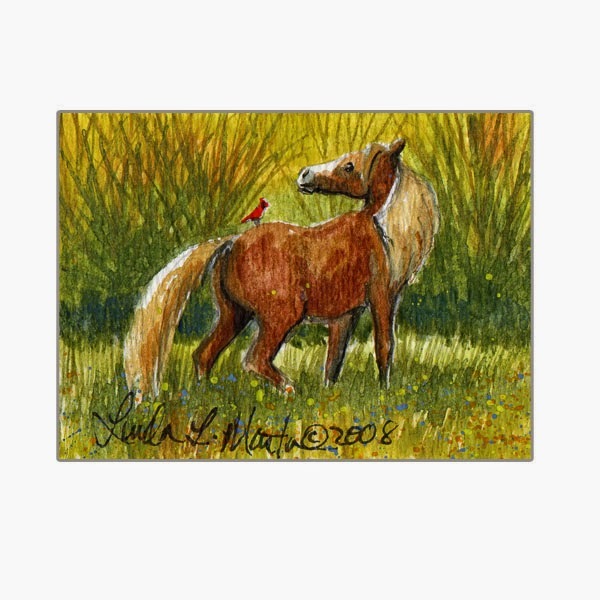 I generally don't sell prints of these tiny works; however, sometimes I will make note card collections based on my favorites. 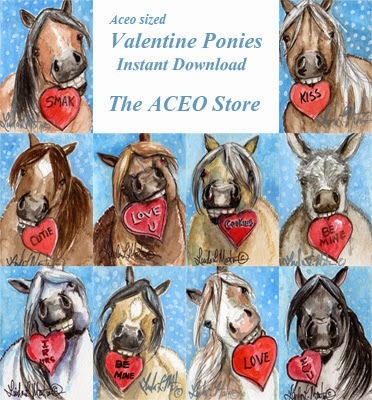 Alot of people wonder what an ACEO is. Well basically it is any art or fine art reproduction that is small enough to fit into a baseball card sleeve approximately 2.5 by 3.5 inches. 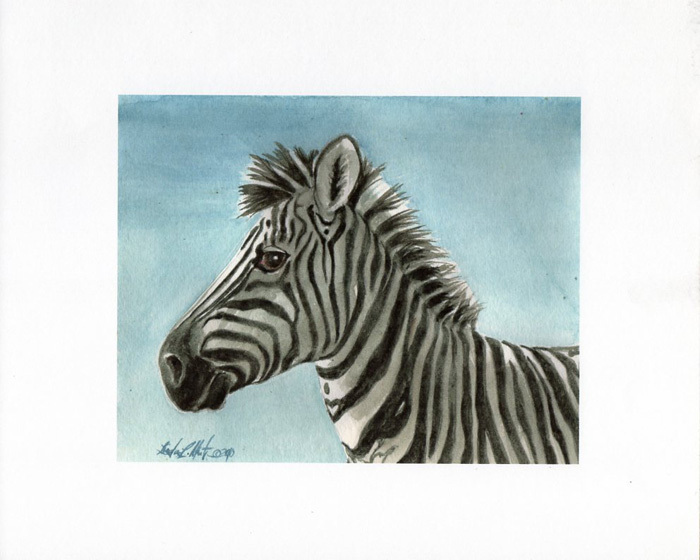 The most modern form of the genre was developed through art sellers online to make art affordable for first time collectors and to introduce children into collecting original fine art and prints. It's actual introduction as a format happened in the middle ages when artists wanted to share their working style or allow new patrons an opportunity to see samples of their paintings. Today we would use a portfolio, email or CD to share our work with prospective clients. 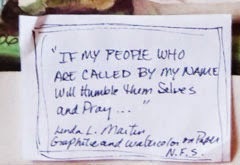 According to one account I read some years ago these artist's calling card were scraps of paper or board that easily fit into the artist's wallet so when he met someone who was a perspective patron he could share a sample. Also the artists would trade them among themselves, using them sometimes as currency at the gaming tables at the local bar or public house. A few years ago I saw something written about miniatures in general and discovered that many were the size of these "artist's calling cards". 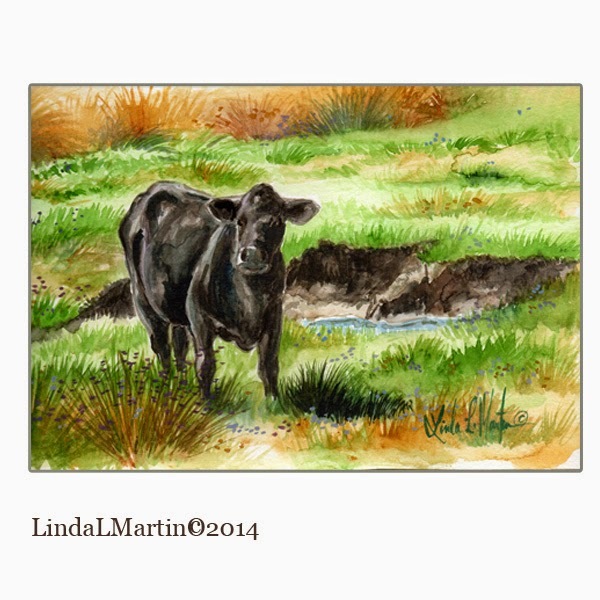 During the Victorian and Edwardian ages art cards were collected among the growing middle class and the gentry. I saw one illustration of how the collections were so large that not only did they cover the entire walls of their drawing rooms with framed art but they collected groups of these miniatures to sit on pianos, mantles and small tables or sideboards. Sometimes they would switch out these small collections based on the times of the year. 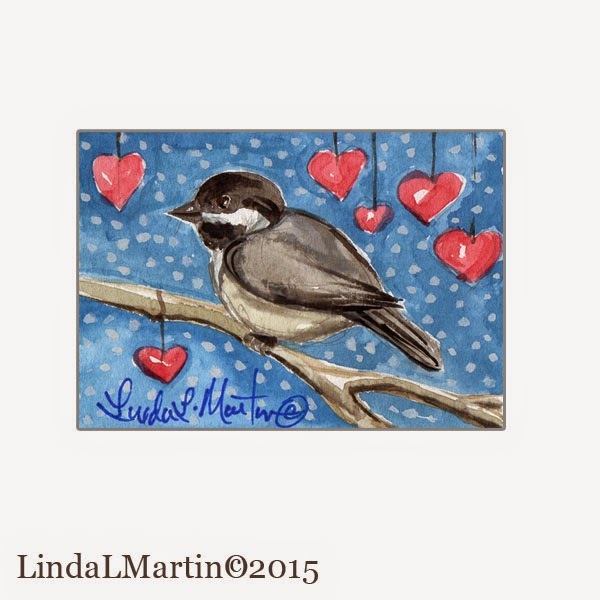 If you would like to see more of my ACEO Miniature work please feel free to stop by the ACEO Store on Etsy as well. All North and South American World and Electronic Rights Reserved. 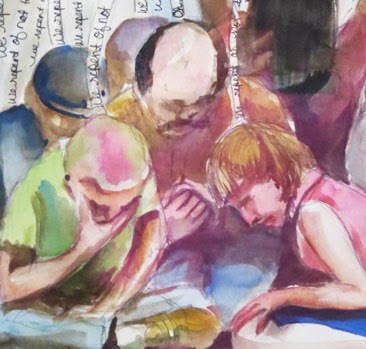 This part of the painting requires a lot of thought. 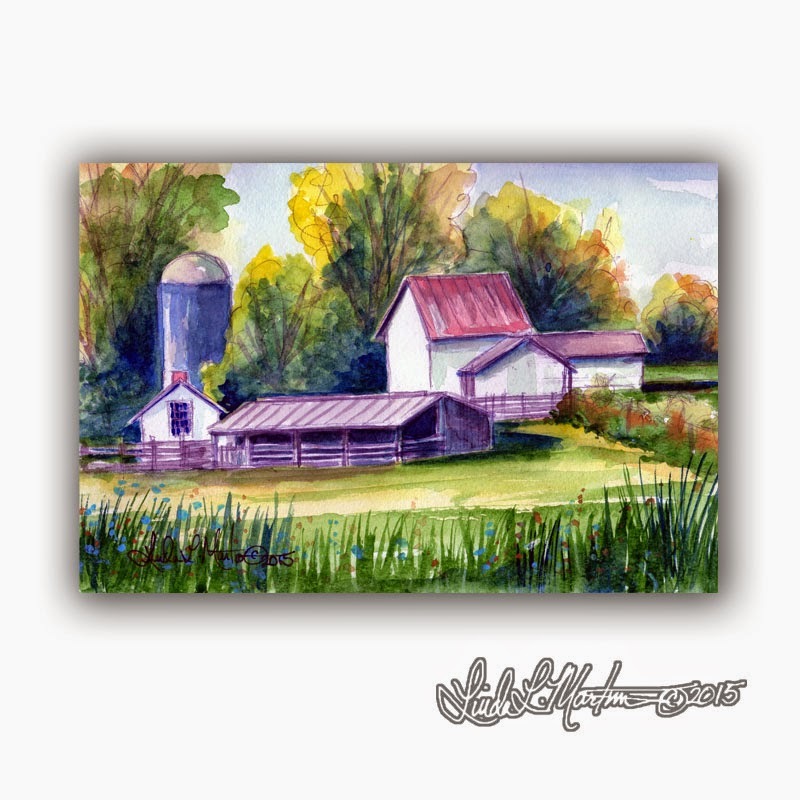 In Watercolor you have to define the lights and dark areas before you actually put any paint on the painting. I actually paint in shape markers and block in the darkest spots before defining the out line. In a water color it is what you leave undone that is the light. 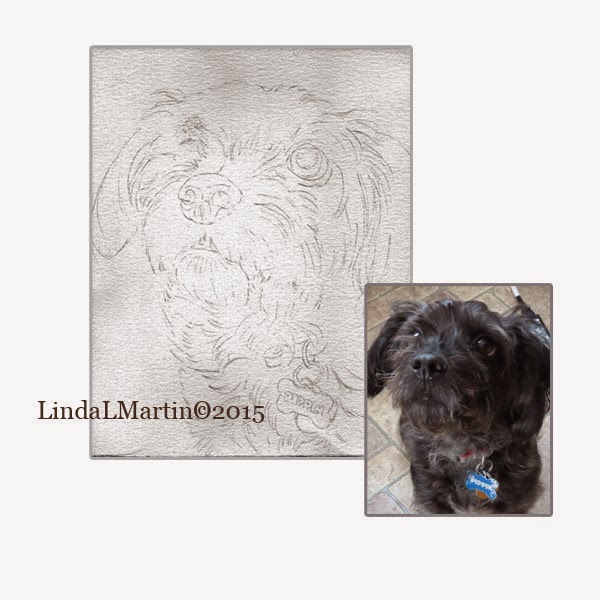 This painting will be an 8 by 10 watercolor head portrait of a JRT/Poodle Cross. Exciting Times and Milestones!!! You do not want to miss this!! I actually put out my very first newsletter today! I am very excited about this. I was looking for a way to let everyone know about special offers and giveaways too!! This is perfect! I am using mail chimp. It has a very easy format and helps me manage the list of all of your names. When I get to 100 subscribers everyone who is on the email list will receive a special gift!! Oh, no, I am not going to tell you what it is yet! But spread the word so everyone knows. Heck! 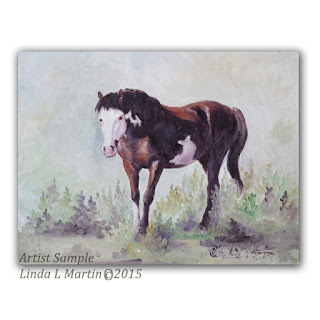 (The Horse, Not the Swear Word) The Surprising reason to paint! 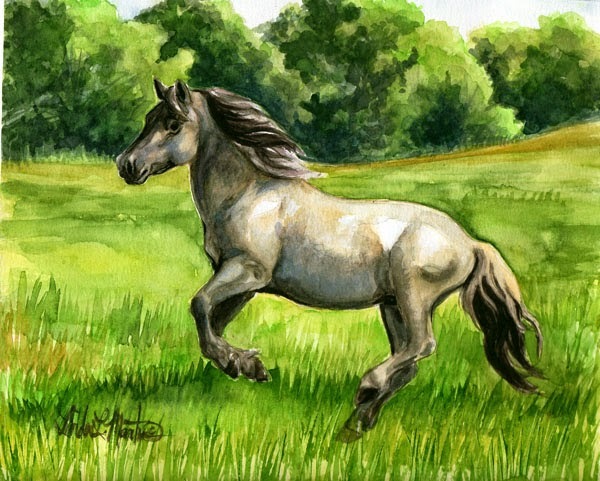 Why I will be painting a lot of these little historic restoration horses over the next few months. The purpose is to learn them. 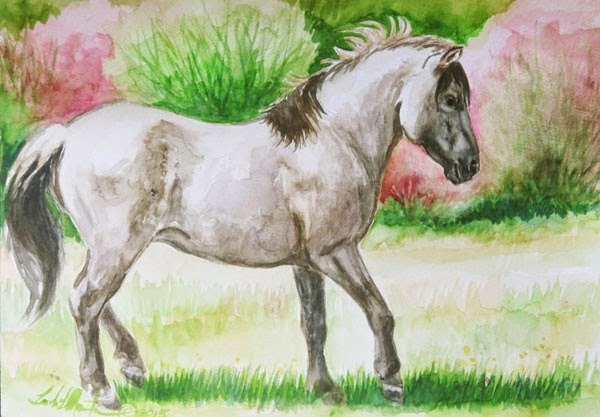 "Heck Tarpan Stallion in Spring"
When I was young I read a book about a groom and a thoroughbred race horse in Japan during the war. In the book in order to be a groom of racehorses, which was an honorable profession, one must learn many things and then one was assigned to a horse for its life time. Besides knowing basic horsemanship and basic grooming skills, in order to be assigned a horse one also had to be able to show proficiency in the bone structure, muscles etc. This was so you knew how to care for your horse and avoid injury and understand how muscles were connected so you could treat injury and illness. I am simplifying it a bit. In the book the young man had to take a test before he was permanently assigned his horse. The test was to draw a horse from the skeleton, to the organs, to the muscles and then to the outer skin. I found it fascinating to read the description of it. When he could draw the horse completely from the inside out that would show that he really knew where things were.Also when asked how to treat injuries he would be able to show where the injury started and point out how to treat by the image he drew. After his training the groom was assigned a beautiful chestnut mare with a wide blaze. When WW2 started all the horses were commandeered. 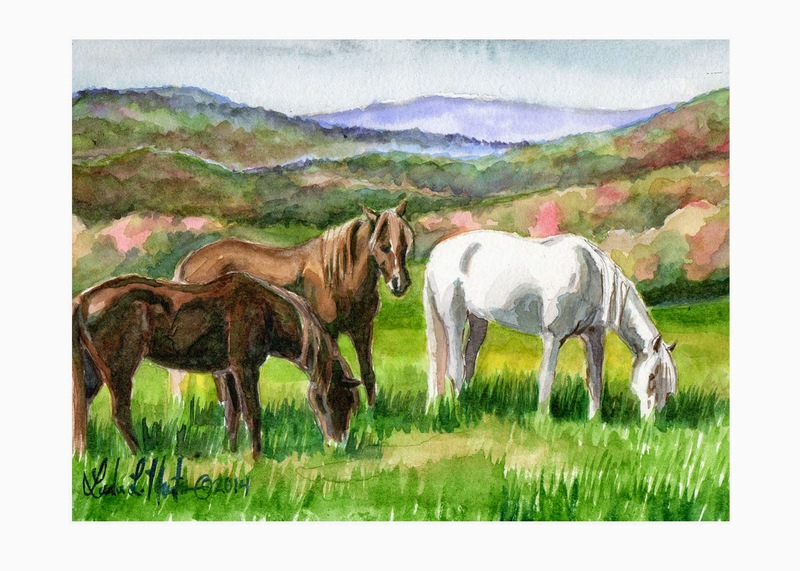 The stallions and geldings were sent off to be war horses and the mares were assigned hard labor. This pair were assigned to the quarry where the mare had to pull a cart of heavy rocks to help repair roads and forts after bombings. Each night the groom would massage every inch of the mare's tired body, so that she did not become musclebound and unable to run again in races. That was the practical part of being a lover of a horse and a true horseman. As the story goes, because of his knowledge of what to do to preserve the mare's true purpose, after the war she went on to race again and become a winner. Later in life I read of Rosa Bonheur and how as a young woman in the 1830s she dressed as a man and she would sneak into stockyards and slaughter houses to study and draw horses and cattle from the inside out. What she did was illegal because she was dressed as a man. 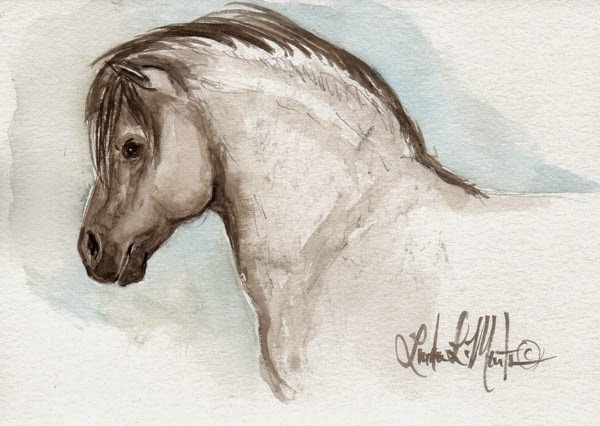 But she seemed to do it with the complete knowledge of her artistic family and manged to surpass them all as well as most of the artists of the day in her skill and knowledge of painting horses. I have other reasons to admire her, including that she kept a complete zoo on her estate in France and was probably one of the first people since the Roman Empire to breed big cats, lions included, on her estate/farm in France successfully. 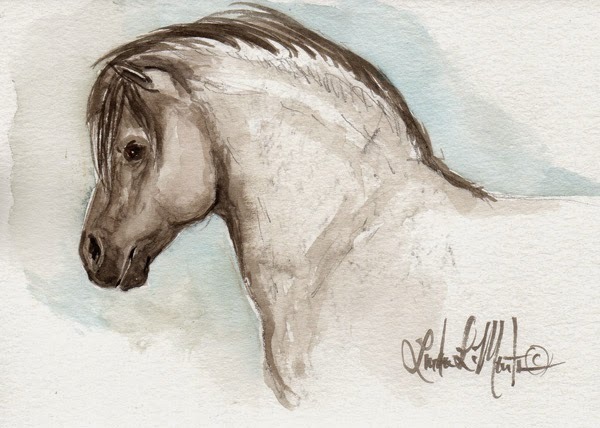 So I am saying all of this because, whether an artist is painting from life, from memory or from photographs, they still have to know what is under the skin of a horse( or any animal) and how to recognize what they are seeing before they can really really paint the spirit of the animal. That takes some talent, some imagination, but most of all that takes skill that comes from a lot of hours and years of practice. One of my favorite quotes of Rosa Bonheur is " If you can not paint your subject from memory, then you have not spent enough time preparing to paint by sketching it from life." 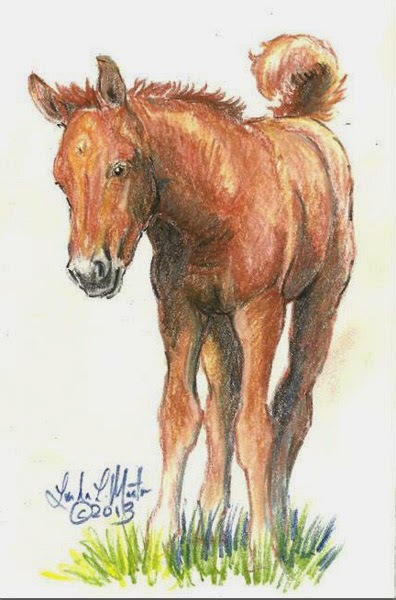 I am, after nearly50 years of drawing, and painting, and sometimes sculpting horses, still practicing. This is the day that is pretty boring for most people to see. It takes a bit of time to make sure everything is laid out right. All the proportions have to be in place and the image placed right on the paper. Sometimes I have to redo the drawing several times before I get it right. 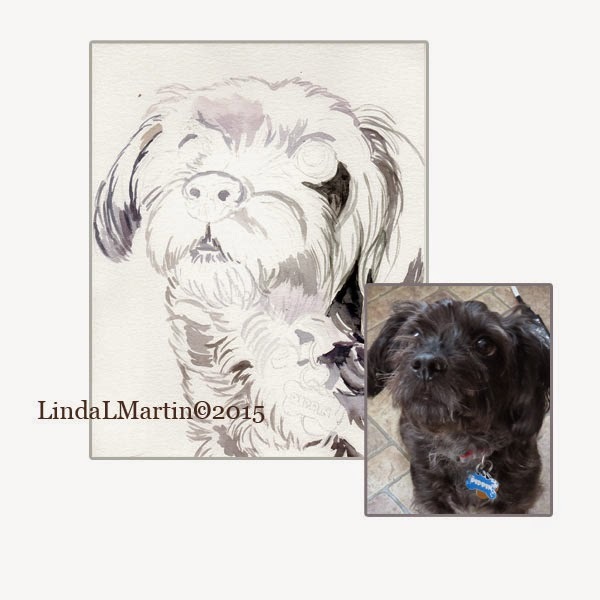 This painting will be an 8 by 10 watercolor head portrait of a JRT/Poodle Cross. Beef Cow Paradise!! You have to see this. for all her Fans, Followers and Patrons! Challenge Three Artist's to do the same. Well, I decided to blog about it too. Good for me and Good for them. Here are my challenge artists: Michelle Severe of Oregon , Kathleen Roeth of Arizona and Rachel Dubber of Ireland. Both Rachel and Michelle have been guest artists on the Mustang A Day Challenge. Thank you to Equine Artist Linda Shantz of Canada for The Challenge. Special Thank- you to John A Wagner who supplied the reference shots for these paintings. 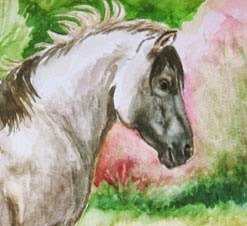 My Three Paintings for Day One are my favorites of the offspring of Sand Wash Basin Band Stallion Picasso. 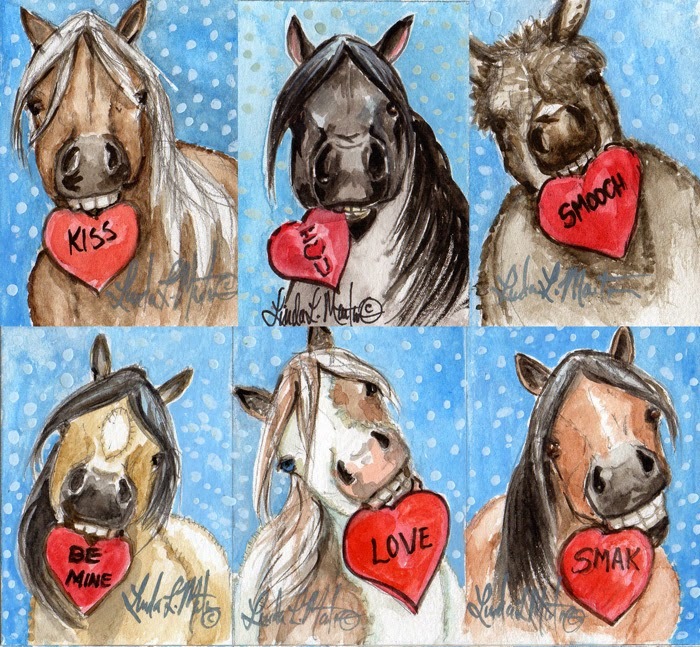 Valentine Ponies Catalog: Where to purchase these adorable little cards!